Excel Electrical Contractors - What is PAT Testing? PAT testing stands for Portable Appliance Testing. This type of electrical test covers a wide variety of electrical devices, appliances and equipment, the purpose of which is to demonstrate that they are safe to use. It is not necessarily a legal requirement that this is done annually. But the frequency of the testing depends on several factors including the type of equipment, the frequency with which it is operated, and the environment in which it is used. For example, a vacuum cleaner with an electrical cable which is used daily, will need to be checked more often than a photocopier. This is because the former is moved more and is the type of item which will show signs of wear and tear. Maintaining electrical equipment so that it is in a safe condition is a requirement of the Electricity at Work Regulations 1989 legislation. A survey by the European Commission found that half of accidents and injuries involving electrical appliances were caused by lighting. The UK charity the Electrical Safety Council has sited extension cables and electrical cords as being an area of risk. Electrical signals between the brain and the muscles are blocked by an electrical current flowing between two points on the body. This can be as low as 50 volts to cause electric shock. The heart and breathing can be stopped and muscles can spasm. These occur when the tissue along an electrical current are heated. This can affect the skin and penetrate deeper tissue, requiring surgery. 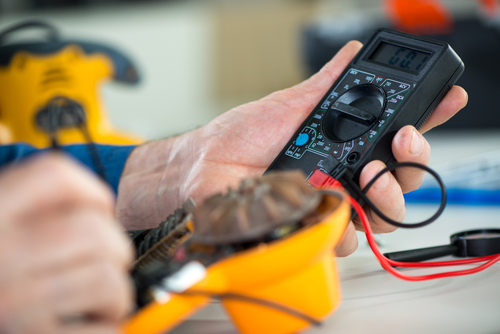 Regularly carrying out visual tests on electrical appliances and PAT testing is one of the means of managing risk and health and safety in the workplace. Excel Electrical Contractors can perform electrical tests in industrial and commercial environments, including PAT testing. Other tests include quality assurance tests on electrical components, diagnostic testing, fault finding on electrical plant, routine safety checks. Contact us to arrange your next electrical test.